pain. With FEZIBO, be more productive and live a healthier life! 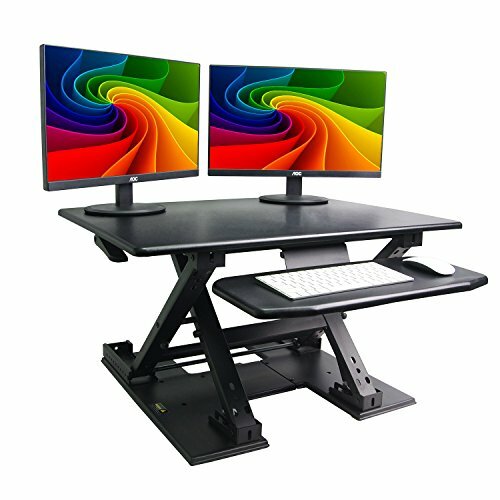 1.QUICK SIT-TO-STAND TRANSITION: This adjustable workstation enables you to strike a healthy balance between sitting and standing throughout the day, allowing for smooth, stable transitions between positions in a matter of seconds. 2.ELECTRICALLY POWERED: The FEZIBO desk is fitted with a certified German-designed electrical motor that complies with ACMA standards. Automatically shift between positions with the click of a finger. 3.VERTICAL TRANSITION: The FEZIBO workstation rises and folds vertically within its own footprint, with no need to adjust the surrounding space to accommodate its movement. 4.DUAL-TIER DESIGN: This special design helps keep your shoulders and neck relaxed while working without requiring additional posture adjustment. Easily raise and lower the workstation while lifting up to 35 lbs. 5.HIGH-QUALITY CONSTRUCTION: The FEZIBO desk has undergone extensive testing for balance, stability and movement, including a fatigue test over 6,000 height adjustments. 30 days of receipt of shipment for free. 5-year warranty for main parts. If you have any questions about this product by FEZIBO, contact us by completing and submitting the form below. If you are looking for a specif part number, please include it with your message.